Swoole is a production-grade async programming framework for PHP. It is a PHP extension written in pure C language, which enables PHP developers to write high-performance, scalable, concurrent TCP, UDP, Unix socket, HTTP, Websocket services in PHP programming language without too much knowledge about non-blocking I/O programming and low-level Linux kernel. You can think of Swoole as something like NodeJS but for PHP, with higher performance. 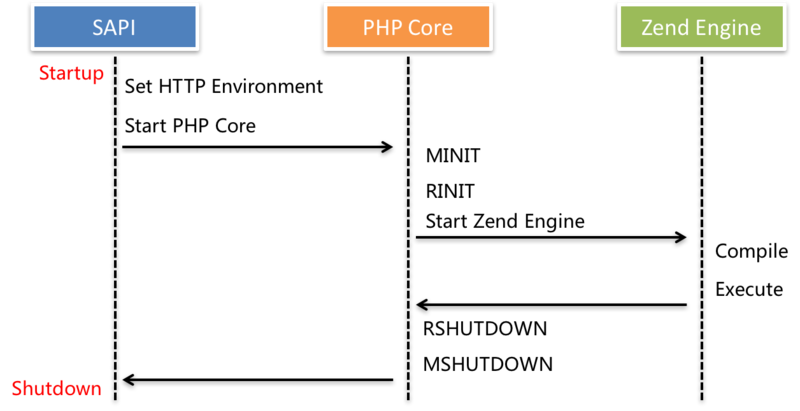 The image below illustrates the lifecycle in PHP. As you can see, when you run php script every time, PHP needs to initialize modules and launch Zend Engine for your running environment. And your PHP script needs to be compiled to OpCodes for Zend Engine's execution. However, this lifecycle needs to go over and over again in each request. Because the environment created for single request will be immediately destroyed after the request process is done. In other words, in traditional PHP lifecycle, it wastes a bunch of time building and destroying resources for your scipt execution. And imagine in frameworks like Laravel, how many files does it need to load for one request? There's a lot of I/O consumption for loading files as well. So what if we have a built-in server on top of Swoole, and all the scripts can be kept in memory after the first load? This is why we try to run Laravel on Swoole. Swoole can be a powerful performance booster and Laravel provides the elegant structure and code usages. That's a perfect combination! Notice: Swoole currently only supoorts Linux and OSX. Windows servers are not able to use Swoole yet. This package relies on Swoole. Please make sure your machine has installed Swoole extension. Using this command to install quickly: pecl install swoole. Visit the official website for more information. It supports package auto discovery. If you're running Laravel 5.5, you can skip this step.